square footage is approx. 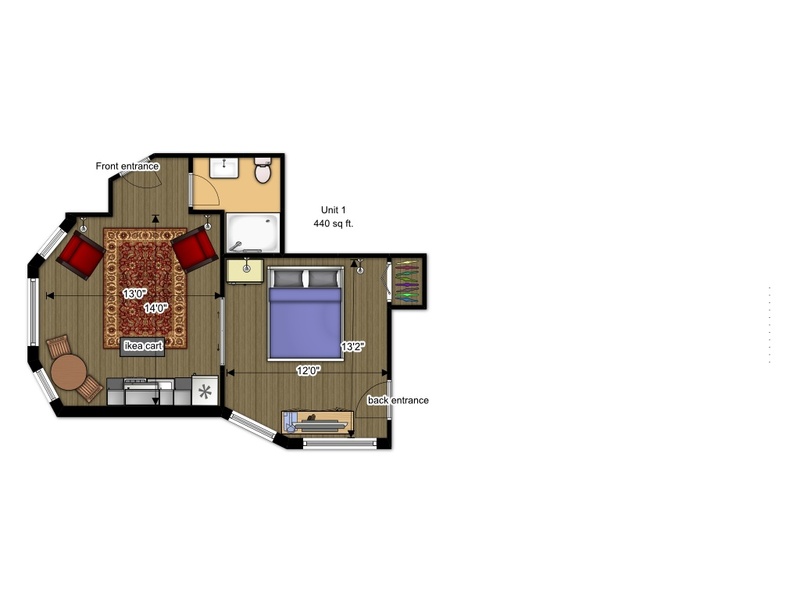 440 sq ft. A Professional micro unit with great big windows! All utilities included. Heat, water, electric, WIFI. Unit has new hard wood flooring, pocket doors to bedroom, new oak trim through out, gas stove/oven, disposal, ceiling fans, wall sconce lighting, tiled shower, wired for speakers, coax and phone. This small one bedroom unit is in a Large historic house with 5 units. The House is located at the intersection of W. Wilson, S Henry and S Hamilton which is 2 blocks south of the capital. Located just a few blocks from the capital and right across the street from the court house! Lake Mendota and Monona Terrace is just a block away. Huge bay window in the front AND in the bedroom. Great Light! First floor, with entrance door in front and in back. This is the front unit with windows facing Lake Monona. NO dogs please. Cats considered. This unit works well with minimalistic furnishings. Two chairs and a desk, or a loveseat with a desk works well. This is a perfect unit for a professional working downtown. Gorgeous view out front window. View of the lake. Very quiet unit, even though it is in the heart of the city. Pocket doors to the bedroom, and ceiling fans in both rooms.